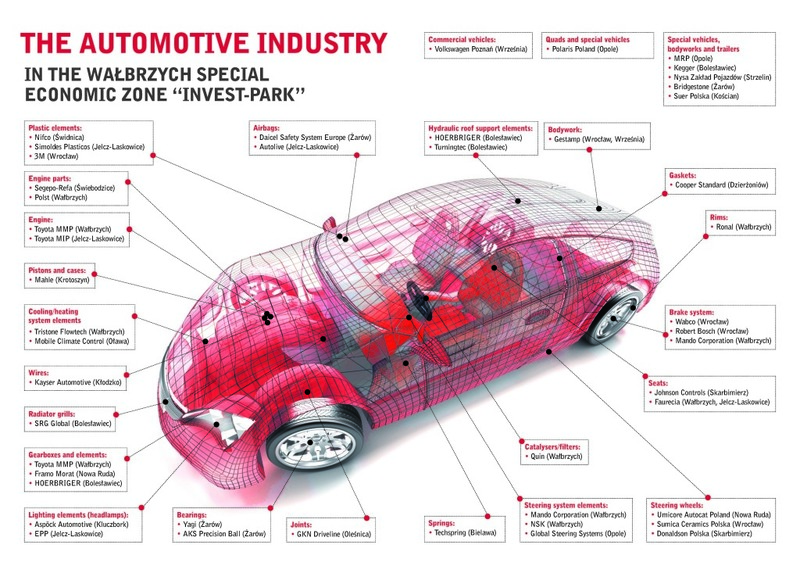 Automotive zone - WSSE "INVEST-PARK". Wałbrzyska Specjalna Strefa Ekonomiczna "INVEST-PARK". Almost 19,000 jobs have been created by automotive companies functioning in the Wałbrzych Special Economic Zone “INVEST-PARK”. It constitutes more than 46% of the total number of persons employed in the zone. In Opole, “AutoForum Suppliers’ Day” was organized – a meeting aimed at establishing contacts by entrepreneurs operating in the automotive industry. The suppliers’ trade fair, co-organized by the WSEZ “INVEST-PARK”, was attended by more than 100 firms from the motor industry. There are currently 176 companies in the WSEZ. Forty-nine of them conduct economic activity connected with the production of vehicles and vehicle subassemblies, or provide services to companies in this industry. Initially, the companies declared their willingness to employ 11,500 people. In fact, around 18,800 employees have been hired, and this number is set to increase considerably in the next few years. Many firms have not completed their investments yet, and recruitment has not begun everywhere. “Each job in the automotive industry is precious because it influences the number of jobs created by a given firm’s suppliers and partners. Therefore, the impact of the new investments is not just local,” emphasized Ilona Antoniszyn-Klik, Deputy Minister of Economy. 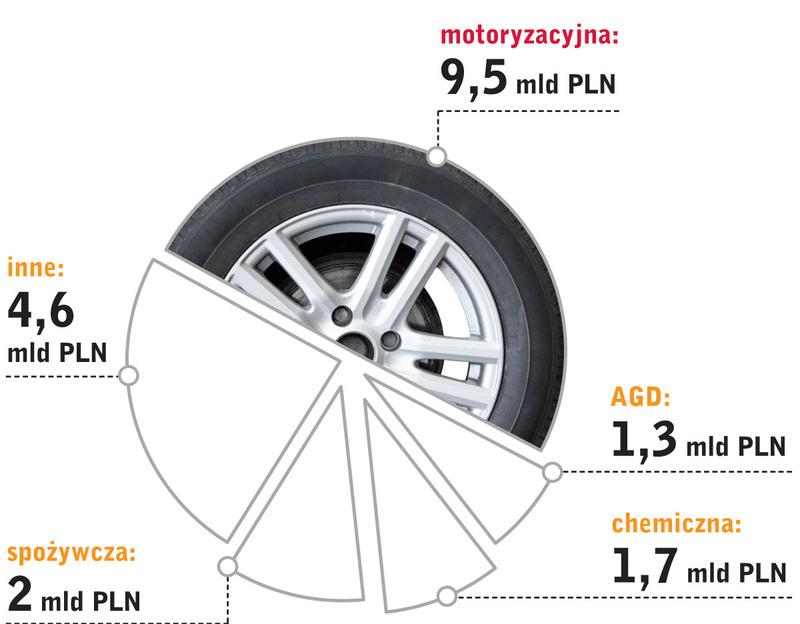 So far, automotive companies in the WSEZ have invested over 9.5 billion zlotys. It is almost half of the total amount of capital expenditure incurred by all the firms in the zone (19.1 billion zlotys). Automotive companies with Japanese capital are most numerous – almost a quarter of all of them originated in Japan. The Japanese have invested almost 4.8 billion zlotys and employ over 4,000 people. The largest among them is Toyota Motor Manufacturing Poland, a producer of engines and gearboxes from Wałbrzych. 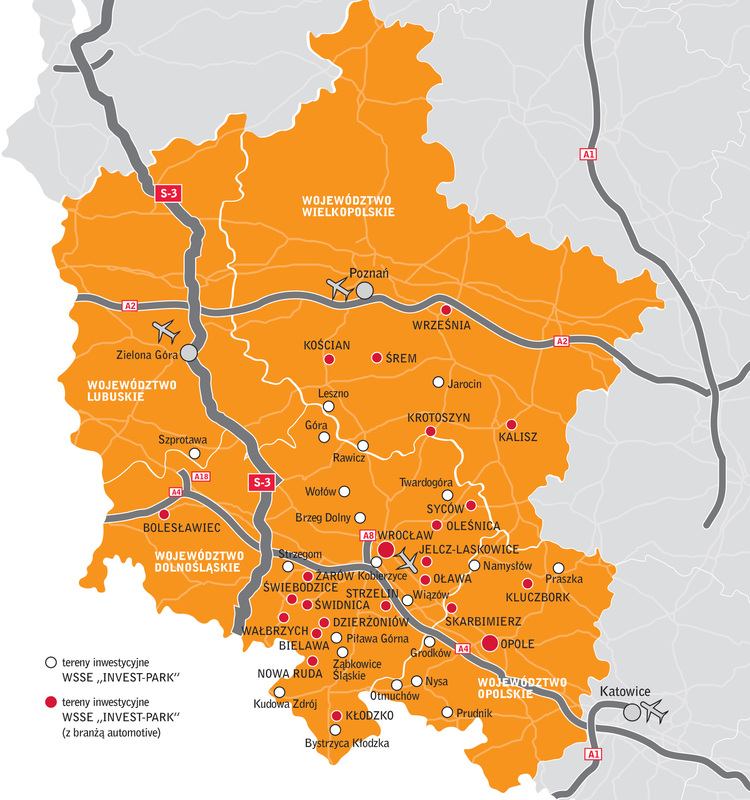 The automotive industry is concentrates mostly in Lower Silesia – 38 firms operate within the area covered by the WSEZ in this province. There are six enterprises in Opolskie Province, and five in Wielkopolskie Province. At the moment, Volkswagen’s new plant is being built near Poznań, which is considered to be the largest investment in Europe in the last decade. The German corporation will take on around 3,000 employees. Constructed within the Września Economic Activity Zone, the plant will become a hub for manufacturing and services companies connected with the motor industry. It is estimated that Volkswagen’s investment will lead to the creation of around 10,000 jobs. “The Września Economic Activity Zone is one of the most attractive destinations for investors in Europe. It can be very easily accessed both by land and by plane – it lies less than 2 kilometers from the A2 interchange and less than 50 kilometers from the Poznań-Ławica airport. We have around 100 ha of investment-ready land near Volkswagen’s plant, with tax exemptions reaching 45% of capital expenditure or the cost of labor of newly-employed workers in the first two years,” explained Barbara Kaśnikowska, President of the WSEZ “INVEST-PARK”. On 18-19 June, AutoForum Suppliers’ Day was held in Opole. More than 100 firms from the automotive industry were represented by over 200 people. The entrepreneurs displayed their products and technologies used at their plants on over 1,000 m2 of exhibition area. It was an opportunity to establish new contacts and look for partners, find out what other automotive firms offer, and learn about the customers’ needs. Representatives of entrepreneurs functioning in the WSEZ participated in the event, including GKN Driveline, Hartownia Hauck, INPOL-KRAK, Johnson Controls, LOG-TECH, MARCEGAGLIA, SEGEPO-REFA, Volkswagen, Toyota Tsusho, and Toyota Motor Manufacturing Poland. Around 800 business meetings took place. “AutoForum Suppliers’ Day 2015 enabled us to establish business contacts with potential partners, both from Poland and other European countries. By participating in the event, we could meet many companies in one place. What was especially beneficial to us was B2B talks with the representatives of our potential customers’ purchasing departments, and presenting our offer to them,” said Anna Pawlak, Commerce Manager at LOG-TECH, a producer of metal constructions for the automotive industry. The Wałbrzych Special Economic Zone has 1,000 ha of free investment-ready land in 44 subzones across Dolnośląskie, Wielkopolskie, Opolskie and Lubuskie provinces. Tax exemptions for entrepreneurs can amount to 55% of capital expenditure or labor costs in the first two years. In 2014, the WSEZ “INVEST-PARK” was recommended by the prestigious fDi Magazine for its complex and high-quality investor services.